The Iowa Association of Cardiopulmonary Rehabilitation is an organization dedicated to providing education and improving communication between multidisciplinary healthcare professionals who promote cardiovascular and pulmonary health. Click "More Information" for location, hotel and registration information. 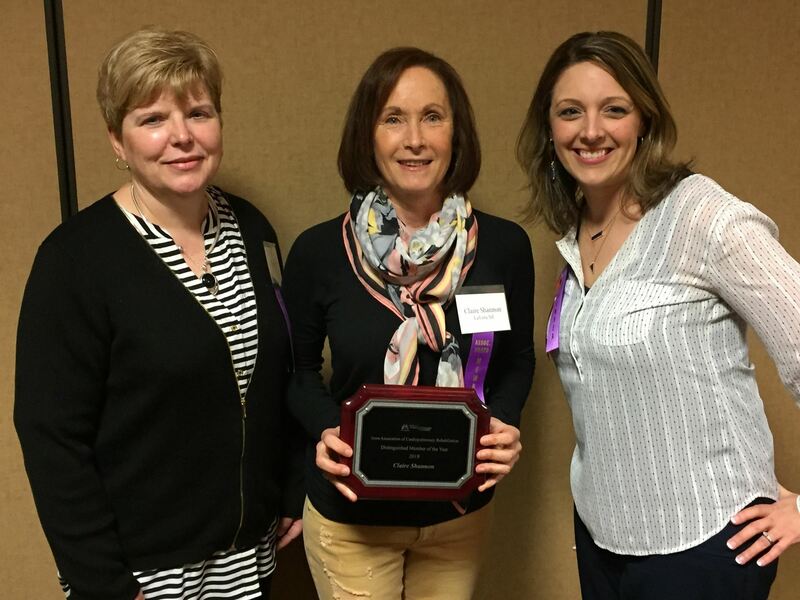 Claire Shannon (C) was presented the IACPR Distinguished Member of the Year award for 2018. She was nominated by President-elect Peg King (L) and Director Aleshia Bloker (R). Latest news on your organization and membership through IACPR.net. Up-to-date information on reimbursement and legislative changes that will affect your clinical practice. An opportunity to publish articles and present research via articles on IACPR.net. A statewide network resource of cardiopulmonary rehabilitation professionals dedicated to the improvement of clinical practice. Discounts for the annual IACPR Cardiopulmonary Rehab Conference. Regional networking sessions several times a year... and more!